According to the Ministry of Health, though the figure of dengue infection cases has seen a 20 percent year-on-year decline in early 2017, the disease is rising in the Mekong delta at present. Reporter of Sai Gon Giai Phong recorded a complicated development of dengue in the Mekong delta City of Can Tho and provinces of Dong Thap, Vinh Long and Ca Mau. Till now, Dong Thap Province has most cases of dengue infection in the region with more than 1,000 cases, including 72 serious cases and two deaths in districts Thap Muoi and Hong Ngu. As per the Department of Preventive Medicine, the disease began increasing in end of May and is forecast to be skyrocketed in October. Cao Lanh Town and districts Cao Lanh, Lap Vo, Thanh Binh. Director of the Department of Preventive Medicine Dr. Duong An Han said that around 50 cases are recorded every week; however, locals are still neglected in preventive and they are just worried of the disease when their neighborhood has a case. Moreover, people go to hospital late for treatment so their illness becomes serious. Currently, Can Tho City has nearly 600 cases of dengue, said Director of Can Tho City Department of Preventive Medicine Huynh Minh Truc. 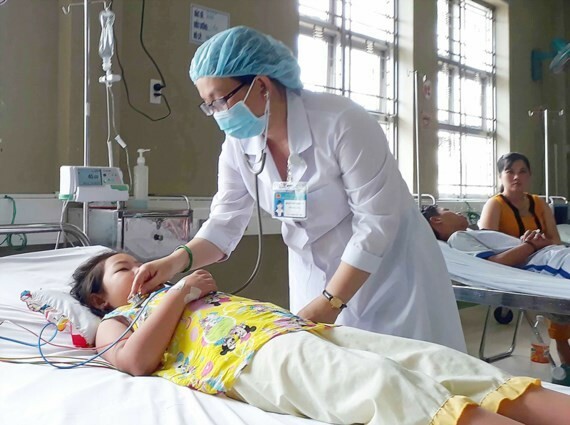 In nearly past six months, the Children Hospital in Can Tho admitted 853 inpatients and treated 2,600 kids in the city with dengue-related illness, a year-on-year increase of 10 percent. Around 84 percent of patients are kids under 15 years old. In Ben Tre Province, since the beginning of the year, though there has been a year-on-year decrease of 20 percent with over 700 dengue cases, rainy season is conducive for outbreaks of the disease. Most cases are reported in nine districts, town including one death in Giong Trom District. Health sector predict upward trend in dengue cases for the next time. The Obstetrics-Children Hospital in Ca Mau province in the southern tip of Vietnam, more children have filled the hospital beds in these days. 379 children are being treated in the hospital. Some kids fall into coma in the intensive care unit of the hospital. Since the beginning of the year, health authorities in provinces have adopted measures to prevent the disease such as increasing information amongst locals yet the infection cases have still risen. Deputy director of the Department of Health in Can Tho City Dr. Nguyen Trung Nghia said that following the complicated development of dengue, People’s Committee and the department sent guideline for mosquito prevention plan in nine districts. The Department of Preventive Health in Dong Thap province continues carrying out the campaign to kill mosquito. Health sector must enhance cases of infection, insect density and virus strain for an early prediction as well as handle the outbreaks to curb wide spreading. The Department of Preventive Medicine in Soc Trang Province and other provinces keep an eye on and kill mosquitos and its larva in the localities. The Ministry of Health warned people to prevent the disease by covering all water containers tightly to prevent mosquitoes from breeding, change the water in vases and for aquatic plants at least once a week and dispose of unwanted containers where water may gather into a covered bin.